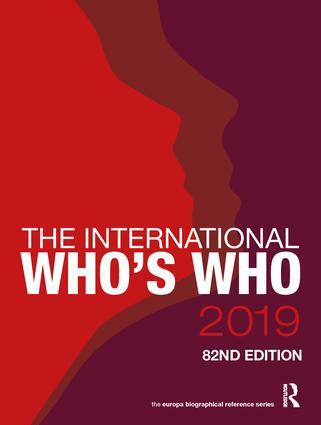 When you need to source accurate information on the past history, achievements and current activities of leading world figures, from heads of state to sporting greats, Europa's The International Who's Who 2019 provides the answer. Published annually since 1935 The International Who's Who is your source for hard-to-find biographical details on over 25,000 of the world's most prominent and influential personalities. Featured personalities are regularly given the opportunity to update their entry, providing new information on education, artistic achievements, leisure interests, awards, contact details and much more. Also available online at www.worldwhoswho.com, featuring thousands of click-through web links and email addresses, and advanced search functions enabling users to search by name, nationality, place and date of birth and by profession. Abbreviations. International Telephone Codes. Reigning Royal Families of the World. Obituary. The International Who's Who 2019.